With anticipation of the 3rd Season of The Walking Dead starting up again in a week, I thought I would try to find some correlation between Millennials and zombies. I recently watched a documentary called “The History of Zombies” on the History Channel that sheds some light on the America’s current zombie obsession. In short, the documentary shows that the idea of zombies encompasses all our most primal fears as humans. Here are a few of those fears: War— in the sense that in zombies are an unstoppable enemy. Disease— the zombie-infliction is contagious, and a man-made disease. Also, in the case of the zombie disease, it is an invisible enemy that can change a trusted ally into a monster overnight. Anarchy— the problem is so large that it completely unravels society. In other words, trust of your fellow citizen vanishes. Cannibalism— the ultimate sign of the desperation, and loss of humanity, although this fear is reflected indirectly since the zombies aren’t actually human. Millennials are used to crises. 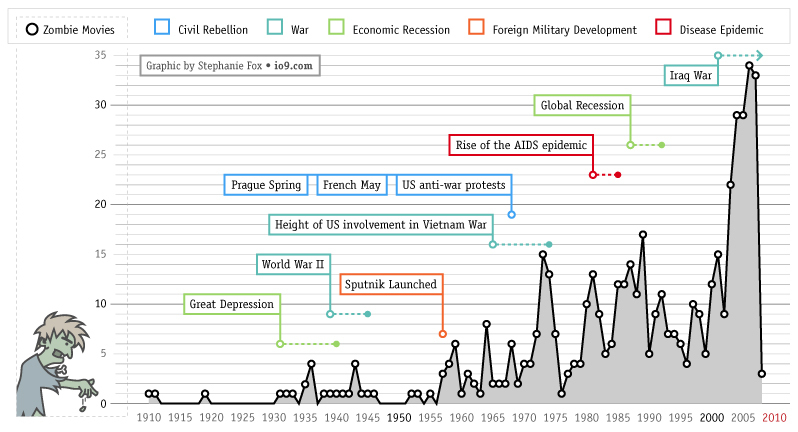 It’s easy to see how Millennials have seen many high-intensity situations in the last decade: War, natural disasters, economic crises. We take it all in stride. Millennials love a good challenge. Not only are Millennials accustomed to imminent danger, but they show a desire to rise to the occasion. The most recent example is the Kony 2012 campaign– not only are young adults dealing with challenges, they are seeking them out and to make a difference. 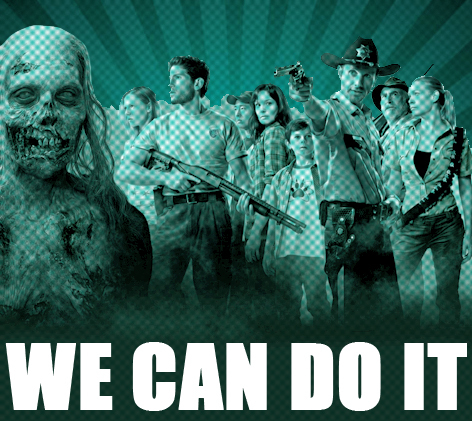 The Walking Dead offers the intensity of trying to survive and overcome in the face of overwhelming odds. I find myself thinking through survival scenarios. You know you’ve been watching too much of The Walking Dead when you see a gated mansion and your first thought is “Wow, that’s totally zombie-proof”. Am I the only one who does this? Millennials understand the need for unity. How unity and survival work together is one theme throughout the series The Walking Dead. If someone is a loose-cannon (ahem- SHANE) it endangers the group of survivors as a whole. As a generation that gets tired of divisiveness, and political agendas, the concept of team work is refreshing, and valuable. Trust, and unity are essential in making progress in any situation. Are Millenninals ready for the zombie apocalypse? What are your zombie-proof plans? Also watch the mid-season premier of The Walking Dead this Sunday, February 10th, on AMC. It’s an interesting connection you make. Every generation has its own take on the zombie genre. The viral theme in zombie cinema has got a lot more prominent in the last decade or so and seems to resonate with my generation (X) as well. Both our generations have had to develop sexually against a background awareness of AIDS, though it was presented far more apocalyptically back in the day… But you lot have grown up with the SARS and bird-flu threats, so you’re possibly pretty attuned to the apocalyptic potential of virals as much or more than we were. Something I notice with your generation though, which I think is quite distinctive, is that while you say you are used to crises and “take it all in stride”, you have (for the most part) seen these crises unfold remotely. There was always a screen between you and the bad stuff (obviously I’m not speaking for your whole generation here, all generation talk is based on generalisation, which can be really unfair and unrepresentative of the individual case). For many of you, there was this protective layer of glass. The power of technology brought the world close but it also kept it distant. You could see wars, disasters, all of it happening live, but through the lens of the telescopic media which brought it into your living rooms and bedrooms and on to your hand-helds, but still kept it on the other side of whatever screen enclosed its image. Even the economic crisis has unfolded in slow-motion (until it effects you personally and then it sudden and brutally real) and this has created a distancing remote effect. But at the same time there is a sense of trouble ahead, as if it any moment all these distant troubles could break through the screen, the fourth wall would shatter under contradictory forces: the sheer impetus of virtualising technology’s advance and the weight of reality just plain catching up with us. Your generation is under some burden of suspense, just waiting for that crack in the glass. I think that is incredibly stressful. No wonder you’re thinking about ways to zombie-proof your environment. All the human problems viewed through your telescope have been approaching all this time like zombie hordes over the horizon, still far off, but always coming closer. Yeah, that is stressful and suspenseful and kind of unnerving. Zombie movies, especially the recent style of post-modern, “knowing” and semi-humourous ones are a way to let off steam about this weird creeping sense of threat. I hope you will all be ok. My generation (generalising again…) probably does think of yours as kinda whiney, but we basically want you to be ok. We’re hoping you’ll hurry up and realise that if you’re going to be, it’ll be because you worked out you had to stop waiting for your boomer folks to clear a path for you (they won’t!) and do it for yourselves. We wanted to, I guess, but we never had the numbers. You are the biggest generation. You have the numbers to change things, but you’re all still a little bit like sleepy children (sorry! ), half caught in a beautiful dream that has undertomes of nightmare. Maybe there’s a half-conscious fear or wish that you might even be the zombie hordes yourselves! It might be easier to surrender and become one of them, after all, than fight to keep your humanity when everything looks about to go to s***! I hope millenials will be ok. I hope you work it out. I think my generation would be happy to help. We have to work out how to solve our problems together. It’s the only way we’ll survive.